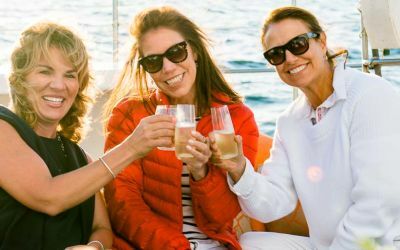 Sip local wine or beer from a featured winery or brewery from your very own Santa Barbara Sailing Center Govino cup while enjoying a Santa Barbara sunset aboard the Double Dolphin on the third Thursday of each month. A representative from the winery or brewery will be on board to pour the tastings and provide education on their selection, while your Captain gives insights on the surroundings. Includes tasting with a reusable Santa Barbara Sailing Center Govino cup that you can take home. Reservations are required. This cruise is 21+. There is no college student discount.